You were born five years ago. Five years ago you changed our lives forever. You've grown into a little lady. Half child - half something else that's not quite grown up yet. Sometimes you're 5 going on 3 and sometimes you're 5 going on 15. I need to remind myself that you're only 5. You're so good to your little brother. You love to sing to him and make him smile. You're relationship with your sister is a little bit more complicated. Sometimes you get along like hot fudge and ice cream....other times you fight like cats and dogs. This drives us totally crazy. Some days, you pick up your toys without us having to ask you twice....other days, not so much. You spend weekends at your friend's house. You make your own PB&J. You write words like "Mom" "Dad" and "Tap" all by yourself. You're quick to say "I love you" and "I'm sorry." You're attitude is bigger than I care to admit. Yesterday you told me, "Mom, I'm a little bit concerned." "I'm concerned because there's no watermelon on my plate." You love art, music and singing. You love you swim but hate getting your face wet. You're a sensitive little soul with a fear of the new and unknown. The smallest things in life excite you. I love you, Ava. I don't feel worthy to be your mom. I'm so lucky to have you...to know you. I want to be the best that I can be so that you grow into a wonderful young lady. Happy Birthday, sweetie. Daddy and I love you so, so much. What is your favorite color? Pink, purple and yellow. What is your favorite toy? Ummm...snowflake and my baby. What do you like to do outside? Ride my bike and ride my scooter and play with chalk. What is your favorite animal? Dogs like Tap and Suzie. What do you like to wear? Ummm I like to wear and blue skirt and a pink t-shirt. What do you like for a snack? Ice cream and donuts and cake pops and twisty fruityloo's. What is your favorite song? "ABC's" and "You Are my Sunshine"
What do you sleep with? I sleep with Olivia and Snowflake and my baby. What is your favorite book? "Clifford Counts"
What is your favorite ice cream? Strawberry and Vanilla and Mint. What is your favorite fruit? Oranges and apples and grapes. Where is your favorite place to go? The aquarium and the zoo. What is your favorite thing to do? My favorite thing to do is to go fishing with my Dad and go in Jasalyn's swimming pool. What do you want to be when you grow up? I wanna be a ballerina. What is your favorite thing to eat? Smoked cheese. Why do you love Mommy and Daddy? Because they're nice and because they do everything for me. What do you want for your birthday? Perfume and lotion and a doll and probly new clothes and a skirt and a shirt and a dress like Jaina and probly some new underwear. Bonus: What's going to be different now that you're 5? I can't eat sugar except I can eats donuts and things like that, and I have to wear different clothes but I already love these clothes and I have to wear different underwear. I have to eat different foods like tomatoes and I have to clean up everything all the time. Mom Note: I think your favorite song is "Let It Go" and your favorite snack is an apple. Ava escaped for the weekend and went to a friends house. This made life easier...Jaina played so well all by herself! The only mishap was when she brought me the scissors and told me that her shirt was broken. Six holes right across the front. :) She talked to herself all day long. "Jaina, what are you doing?" "I not talkin for you. I talkin for myself!" "Jaina, come and get dressed." Now it's Tuesday. We don't have hot water. I have a mountain of paperwork and at least a week of cleaning left to do. still a super good baby! even after sleeping 9 hours straight at night, he wakes up in the morning happy, smiling and hungry! No crying for this kid! when I walk into the room and say his name, he turns his head toward me and smiles. starting to grab things and if he can get it in his mouth, he does. already had his hair cut! "Mom, what's a throapula?" She meant uvula. "Ava, I'm going up to take a shower. Don't wake up Oscar." "Ok, Mom! Thanks for the advice!" "What ferocious human knocked these down?" She laughs at Daddy and says, "Haha! Funny guy!" "Mom, I tell you sumfin." "What do you want to tell me, Jaina?" So we sang "Tell Me the Story of Jesus"
Then she said, "I wuv God." I'm so amazed at what children learn at such a young age. We rent a condo on the lake. We love it and the view. The neighbor sold his condo without telling his wife. They called up our landlord and offered to buy our condo. They close at the end of the month. We haven't found a place to go. Actually, we made an offer yesterday. Looks like Texas will be home for a few more years. Oscar had his first haircut on July 4th. His hair was getting pretty long on the top and rubbing off on the sides. 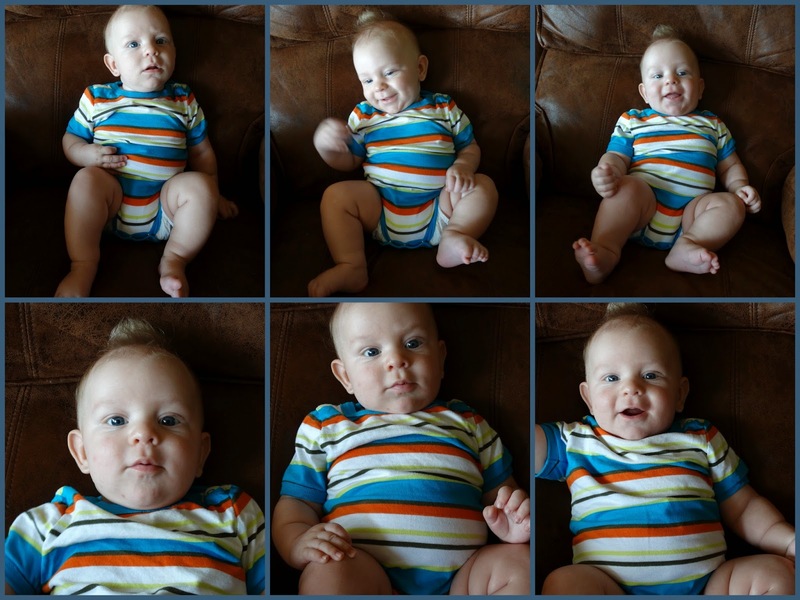 :) So, just a week shy of 3 months, he got his first haircut. It was also his first time in the Bumbo....he was a little wobbly. It turns out that Oscar is ticklish. He giggled for the first time at 2 1/2 months. It was so cute!